Celebrating Frank’s 100th birthday, “A Night With Sinatra” features a 7 piece orchestra and will focus totally on the music of Frank Sinatra featuring Rick Michel. Michel will salute and interpret “Ol’ Blue Eyes” standards. Michel has been called “the closest thing to Sinatra we have ever heard” by Variety. 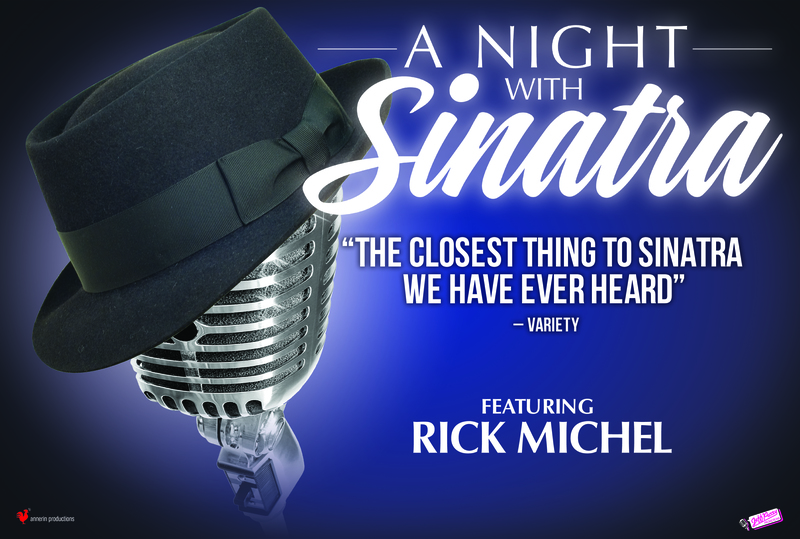 Michel will cover everything from the Big Band days through the Rat Pack nights, touching on Sinatra classics such as “Witchcraft” to even lesser known hits as “I’ve Never Been in Love Before” from the musical “Guys and Dolls.” Come and witness Michel embody Sinatra’s charisma and let his voice take you away. In 1994, Michel shared the spotlight with Rich Little playing Bob Hope to Little’s Bing Crosby and Jerry Lewis to his Dean Martin. Little called Michel “one of the best impressionists around today.” Do not miss your chance to hear the reenactment of one of the most influential musical artists of the 20th century.